USS Warrington, dark and deserted. Many Americans probably believed that by 1972, the war in Vietnam was essentially winding down. However, for the U.S. Navy in Vietnam, 1972 would prove to be a busy year of conducting numerous and dangerous combat operations. My ship, USS Rich (DD 820) docked on November 18, 1972 at the Subic Bay Naval Station in Subic Bay Harbor at 0710. The ship would remain in Subic Bay for six days while making the necessary preparations and alterations to enter the combat zone of Vietnam. From our berth, USS Warrington (DD 843) was clearly visible where she was moored at another berth in the ship repair facility. The ship was abandoned now and had a mystic look about her similar to that of an empty and deserted old house. On July 17, while operating in company with USS Hull (DD 945) and USS Robison (DDG 12), Warrington came under the rapid and heavy fire of North Vietnamese shore batteries; but she took prompt evasive action and avoided damage. Later that same afternoon, though, the ship was rocked by two underwater explosions close aboard on her port side. It turned out that the ship had disregarded warning messages and entered a known area where U.S. aircraft jettisoned bombs and mines, so the mines the ship had stuck were ours. It may also have been a case of where aircraft dropped the mines where they shouldn’t have and Warrington simply stumbled onto mislaid mines. She had suffered serious damage in her after fire room, engine room, and in the main engine room or main control. Warrington’s crew had been able to control the damage and flooding from the mine explosions, which enabled the ship to retire from the area under her own power. Ultimately, it was determined that the ship was so badly damaged that she had to be towed to Subic Bay. Once the ship was back at Subic Bay, the Navy’s initial intent was to repair the ship and return her to service, but in August, an inspection and survey found her to be unfit for further naval service. Warrington was decommissioned on September 30, in Subic Bay. The now deserted and dark USS Warrington stood as a stark reminder to me and many in our crew of what could happen to any ship operating in the waters along Vietnam’s coast…If you would like to read more stories in “Striking Eight Bells,” use one of the following links to booksellers: Amazon.com: Books, Barnes and Noble Booksellers, BAM –Books A Million and Smashword.com eBooks. 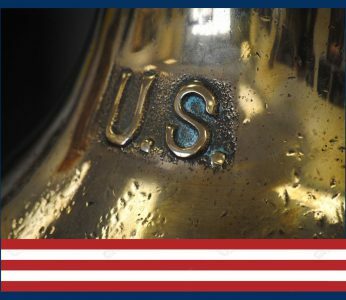 The stories in these posts and the book; “Striking Eight Bells: A Vietnam Memoir,” reflect the author’s recollection of events. Some names, locations, and identifying characteristics have been changed to protect the privacy of those depicted. Dialogue has been recreated from memory. Dates, times, and locations were recreated from declassified U.S. Navy records and others. Photographs used are either public domain or owned by the author. Illustrations and maps used were either created by the author or in the public domain. The stories in these posts and the book are solely the opinion of the author and not the publisher, Richter Publishing, LLC. *Image was found in public domain or it could not be established after reasonable search, that any claim existed to the image. Image used for illustrative purposes only and is not the property of the author. Where ever possible, credit for the image is indicated in the caption. Never knew what eventually happened to the Warrignton – I was on Robison at the time and we helped tow that old gal back to port – hadn’t really thought about it till now – we had to help keep the Warrington crew fed and watered – thanks for bringing the old days back to the light of memory. John, Thanks for your comment. The Warrington was eventually sold for scrap, I believe to Taiwan. We followed the radio traffic closely on the Warrington. Our chart PO always kept the bomb drop hazard areas updated, this incident occurred after the Haiphong mining as I recall and at the time we speculated as per traffic it may have been a wayward mine but, never knew for sure. Later in the summer in Subic we were nested outboard the Warrington. She was looking much better then the picture here. Her paint was still fresh and the crew had just left her, only a civilian quarter deck watch was manned. Being another Gearing we decided it was a good time to obscound needed CIC equipment, cast aluminum deck mounted chairs etc. For our use. We stationed a watch to chat the guard and some of us climbed aboard Warrington just aft of the bridge which was a mirror image of our ship. We knew she was headed for Scrapping and we were headed back to the Gulf for what turned out to be our most active and dangerous cruise of the three I made to Vietnam. I was the chart P.O. for CIC on Rathburne DE 1057- when the Warrington was damaged there were a whole lot of chart correction messages rolling in. So I spent a good amount of my time while we were in Subic working on charts.